If you’re on Pinterest or Facebook, I’d dearly appreciate it if you could use one of the buttons above, thank you! Looking for a special Valentine’s dinner for your family? This is what we’ll be having! You know, every time we sit down with our family to enjoy a meal together it is an occasion to be grateful for. Sometimes, though, extra special occasions take place. Birthdays, celebrations, anniversaries, milestones, or holidays. On these occasions, we might want to cook something a little extra special and this meal is one of those favorites for me. The great thing about this meal is that it is something that you might order in a restaurant, but you can easily feed 6-8 people with this meal for under $20.00 – or feed a family of four twice. Now don’t go thinking I spend this much on a homecooked meal on a regular basis! Most of my suppers cost less than $10 to make, some significantly less. Soooo this is how I make my steak Kabobs. This recipe works just as well for chicken, too. Just substitute boneless skinless chicken breasts and follow all the instructions just as they are written. Ready for some good food? Lets get cooking! To get the recipe for my 3 Ingredient Rice Pilaf, click here. 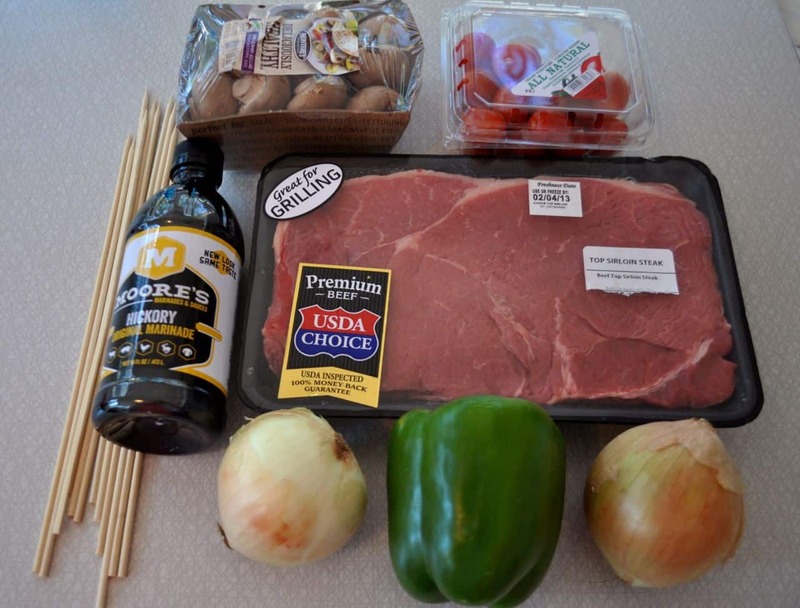 You’ll need: 1-2 pounds top sirloin, 1 bottle Moore’s or Dale’s Marinade (or a recipe of my All Purpose Marinade, click here), wooden kabob skewers, and some vegetables of your choice. Top Sirloin, when prepared this way, is tender and full of flavor. I really like to use cherry tomatoes and onions because the tomatoes get so very sweet when cooked this way and the onions add a lot of flavor to the meat. I’m also using a bell pepper and some mushrooms. Feel free to use whatever vegetables you have on hand or your favorites. Using kitchen shears, cut the top sirloin into bite size pieces. I generally cut mine into about one inch cubes. You don’t have to be precise here though. Just make sure it is a small hunk of meat. 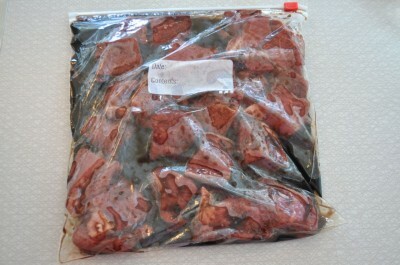 Place the meat in a zipper seal bag and add 1 cup of marinade. Seal well and put in the refrigerator for at least an hour. You can marinate this the night before if you like. 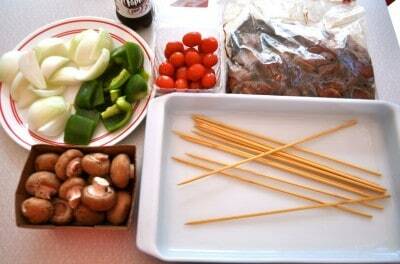 Thirty minutes before you’re going to cook your kabobs, place some skewers in a dish filled with water to soak. Cut your veggies into bite sized chunks and set up a skewering station. I just like how intimidating that sounds. Imagine if someone were to call while you were doing this and ask what you were up to. 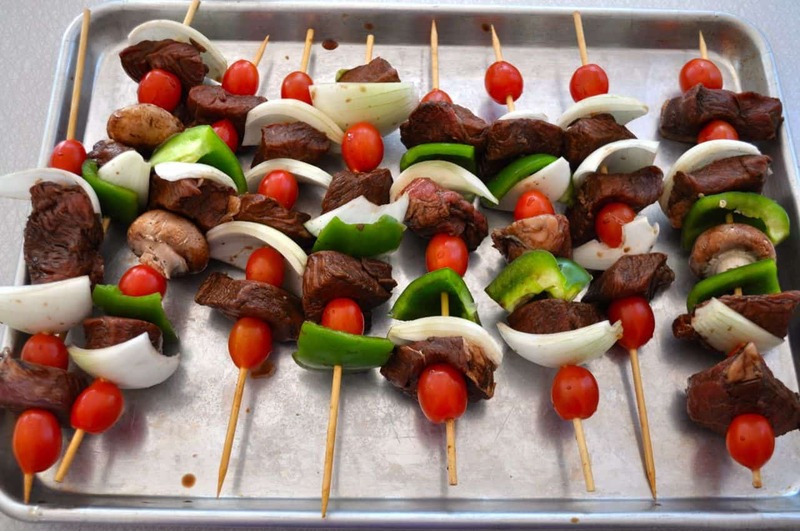 Using whatever pattern you’re in the mood for, skewer veggies and meat onto your kabobs. I like to start and end with cherry tomatoes, but sometimes I don’t. I also like to place onion slices next to the meat, but sometimes I don’t. I really like to sing Fantine’s big “I dreamed a dream” solo at the top of my lungs, but my family is thankful that I usually don’t – unless a moment just really calls for it! There does not need to be a rhyme or reason to this so just do it however you want to. If I end up with a lot of extra veggies, I make kabobs with only vegetables. These are wonderful to serve on the side! Place all of these on a rimmed baking sheet to catch the juices and bake at 350 for thirty minutes, turning every ten minutes, until meat is cooked through and veggies are lightly browned around the edges. See that gorgeous rice pilaf in the photo? It has so much flavor that it just about takes to singing as soon as you get a bite in your mouth, and it is Easy with a capital “E”! You can get the recipe for it by clicking here. Now go ye forth and haveth ye a wonderful day! 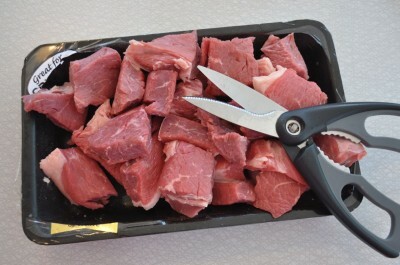 Using kitchen shears, cut the beef into bite-size cubes. Place the beef in a gallon-size ziplock bag and add 1 cup of the marinade. Let the beef marinate in the refrigerator for at least one hour or up to eight hours. 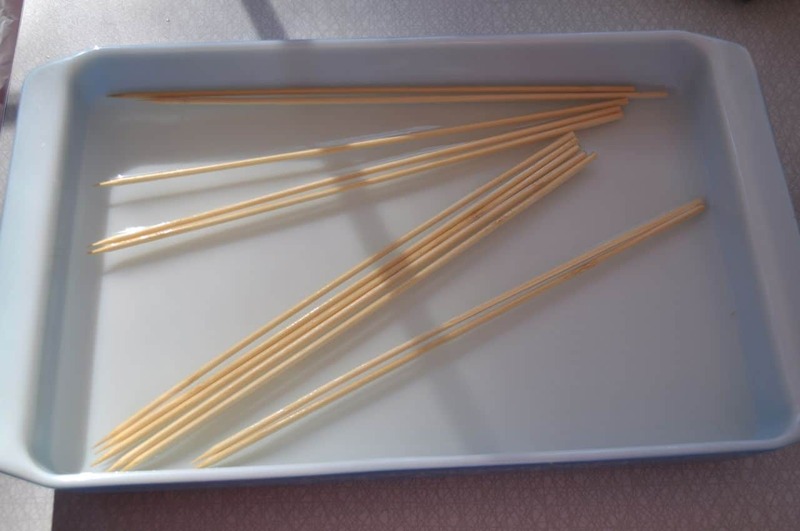 Thirty minutes before you plan to cook the kabobs, preheat the oven to 350 and place 8 to 12 wooden skewers in a bowl and cover them with water to soak. Remove the skewers from the bowl and thread the beef and vegetables onto them, placing a vegetable between each piece of beef. Place the beef kabobs on an ungreased, rimmed baking sheet and bake the kabobs, turning them every 10 minutes, until the beef is lightly browned on the outside and just lightly pink in the very center, about 30 minutes. Just picked up some sirloin on sale this a.m. This looks like a great way to use it. Pinning this recipe. Oh my goodness Janet, don’t you love finding meat on sale? GO YOU! Let me know how you like them! I would try to let this be that one thing you cook right before eating as meat can so easily dry out. Maybe go ahead and assemble but store in marinade and then pop in right before the meal. You are right about not cooking ahead. That is asking for trouble. My committee and I assembled 200 kebabs and refrigerated them in marinade overnight, then we oven-roasted them for an hour at 350 degrees covered with foil to serve at the last minute. Oven-roasting the kebabs was much easier than trying to grill enough for a crowd, and our guests really liked them! 🙂 I am so glad everyone liked them!!! Just wondering, if using chicken, how long should you cook them? A big bottle of Zesty Italian Dressing also works well as a marinade. We’ve done this for a number of years, with hubby grilling them. I’ve gotten to where I put the meat and veggies on separate skewers, because the meat shrinks a little while cooking, leaving the veggies swingin’ around the skewer (we use the metal ones) and dropping to the bottom of the grill. Hate that when it happens. If you do that, be sure to brush the veggie skewers with the marinade before cooking so the veggies don’t stick to the grill. I think they all just do better when cooking in the oven, it’s an even temp from all sides and not that flash of hot heat from the bottom or occasional flares. I’ve always cooked mine in the oven but if someone ever volunteered to grill for me I wouldn’t turn it down – and I’ll direct them to your great hints! Thankyou! WHERE’S THE RICE RECIPE??? IT LOOKS YUMMY TOO! I’ve got it almost done and will try to get it up today but definitely by tomorrow 🙂 Thank you! Oh yes, we would marinate all the meat, veggies & fruit together…always turned out to be very good. I ALSO HAVE USED ITALIAN DRESSING FOR THE MARINADE–SO GOOD! WHY DID YOU CHANGE THE SPELLING OF “KABOB” TO “KEBOB” IN YOUR INSTRUCTIONS??? I am going to try this. I love that you can fix it in the oven!! Christy, we like our steak on the rare side of medium rare. How “done” will my meat be if I follow your directions? Just looked at your rice recipe…so easy! Can’t wait to try it. I hope you get the chance to really soon Jean, it is so good! Made the Kabobs and used your marinade, also made the rice. Both were a hit. Thanks again. I am so glad to hear they were a hit!!! I am so glad to see a recipe that can be made in the oven! I am not a griller either Christy. I am going to try this for valentines day. It looks easy and delicious!! My husband is not a rice fan – so I need a different side. Any ideas? I know you have lots of them! You could use about anything Vivian! How about Sweet and Sour Green Beans? Ok, that may have popped out because I am craving those today, but it does sound really good! Hey Christ, do you have a recipe for Sweet and Sour Green Beans? Yes, that sounds yummy!!! I love sweet and sour stuff. Sorry misspelled your name 🙁 Christy! Hey Christy! I found your Sweet and Sour Green Bean recipe! OH MY! It sounds and looks marvelous! Can’t wait to try it. I love your web site! I love cabbage also and found the “fried” cabbage recipe also. 🙂 Yea, us southerners love that fried food don’t we? Thanks again for all you do! God Bless! I hope you enjoy both the recipes Barbara!! Blessings to you!! My friends do kabobs all the time and the side dish they use is egg noodles (cooked then put a little butter). I never thought of it but now wouldn’t serve kabobs without the side of egg noodles (wide ones). I know this is an old post but I’m just now looking to do kabobs in the oven. Enjoy! Thanks again Christy!! Every recipe of yours that I’ve made has been a success. I was worried that it didn’t taste “grilled” enough, but my husband loved it! I made chicken and steak. Lots of leftovers for later too. I am so glad to hear you liked them Maryam!!! I really want to try this. Have you tried them using the broiler in the oven to cook them? I love Moores’ marinade. 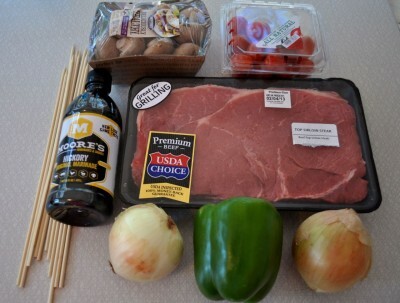 I use it to marinate flank steak with pineapple juice garlic and black pepper. It is yummy. Doing mine with chicken! thanks!!! I hope you enjoy Angel!! Hi Christy! We met at the Blue Plate Cafe last July…I recently sent an email to you dated February 5…please check it out when you get a chance…the subject is…we met in July ….thanks and have a beautiful day! I made this for me and my husband on Saturday night and it was hit! I was a little worried he wouldn’t like it since it wasn’t grilled, but he loved them. So did I. Definitely an easy recipe that is going to make it into our regular rotation of meals. Thank you! I am so glad to hear that y’all liked them Sharidan!! Christy, I just had to make the kabobs for my guy and I, I had it all planned for Wed. night and than he reminded me no meat, Ash Wednesday!! Oh my gosh, so I made it with shrimp and my gosh was it awesome! Made the rice also! It was a big hit with my guy and myself!! I scrapbook all my favorite recipes and these are in the front of it!! So easy and delicious, thank you for sharing!! I am so glad to hear that you liked them!! Christy, I had this for dinner last night, as well as your rice pilaf and cream cheese pie. Everything was great! My husband said these recipes are keepers! Thank you for your wonderful recipes. You are such an inspiration in all ways! Made these for our dinner in front of the fire on Valentine’s day along with the rice pilaf. What a hit! My honey and I made them up–we had fun doing it together. Baking them worked really well, much better than the often unpredictable grilling. The rice was good too–was worried that it would be too salty with the bullion, but no, just right! Thanks for great recipes for a lovely evening. I am so glad to hear you had a wonderful night and enjoyed the recipe!! 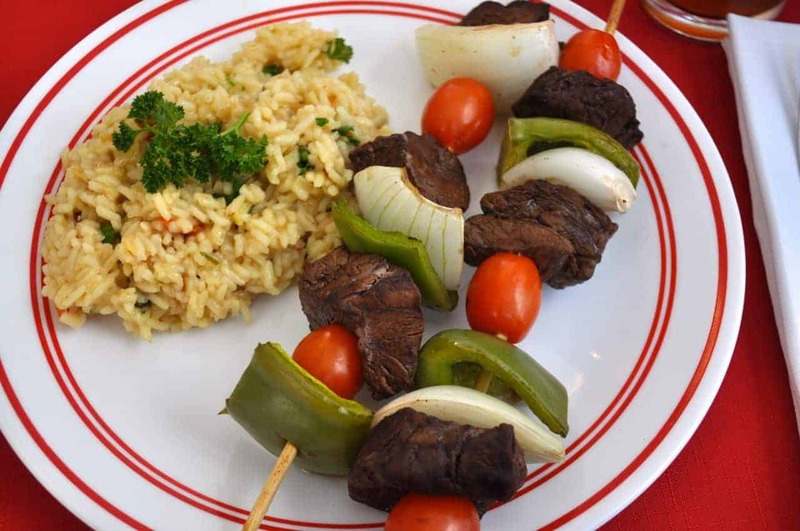 We had Steak Kabobs for supper tonight and they were so tasty. Since there are just the two of us, we have enough for two more meals. That’s my kind of recipe! My husband said this recipe is a “keeper.” Thanks for another delicious recipe, Chrity. Oh my goodness, I am so glad to hear you liked them!! They are a favorite here as well!